There are two kinds of snake bites: venomous bites and non-venomous bites. A venomous strike (if venom is actually injected) going to hurt incredibly badly and both venomous and non-venomous bites are going to bleed profusely. Both types of bite can be serious, though only one is fatal. If you’re bitten by a snake, medical attention should be sought as soon as possible. Venomous Snake Bites: The most common reason people get bit by poisonous snakes is when people attempt to catch or kill snakes! Most of the time, if you leave a snake alone, it'll leave you alone, and no snake will every pursue a person to strike for no reason. Some bites do occur by accident. Snakes are often camouflaged in their natural environments, making it easy for them to be overlooked and stepped on. A snake needs only to feel threatened before it bites. This threat can be initiated by being stepped on or simply by being too close to the snake for its comfort. A snake bites a human out of fear, not out of aggression. If you are bitten by a venomous snake, time is of the utmost importance. The sooner you get to a medical facility, the sooner you will prevent the toxin from spreading through your system. 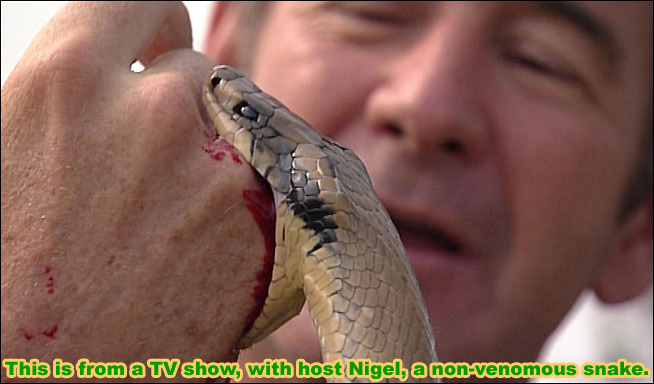 Non-Venomous Snake Bites: Non-venomous bites often occur by accident, though most non-venomous snakes are shy and will retreat from a person before biting. If the snake feels antagonized, that is when it will most likely strike. Most snakes have an anticoagulant in their saliva. This will keep the wound open and bleeding, so applying pressure to the area is important. Even small bites can be prone to infection and complications, so it is important to seek medical assistance as soon as possible. What To Do For Any Snake Bite: If you are dealing with an unidentified snake, there are a few tips that will help you while you wait for medical assistance. First, do not move unless it is necessary. Movement will increase heart rate, and an increase in heart rate will increase circulation. If the snake is venomous, an increase in circulation will spread the toxin through your body faster. Do not lance the skin above or below the bite. There is no scientific proof that bloodletting will remove any poison. In reality, the toxin is usually well up the limb by the time a knife is produced to slice the skin. Doing this will only increase discomfort. Similarly, sucking on the bite area will be ineffectual, placing you in harm’s way through ingestion of poison. Another common but false tip is to apply a tourniquet to the affect extremity. By cutting off the blood flow, you risk losing the limb regardless, even when it may have been saved with the administration of anti-venom. The bite should always be washed immediately with soap and water to help lessen the risk of secondary infection. If medical care is over fifteen minutes away, it is recommended that a bandage be placed over the bite, applying pressure but not cutting off circulation. Snake bite kits will often have suction devices to use on the wound. While using your mouth as a suction device is not advised, the benefit to using a strong, commercial, suction tool is acknowledged. The easiest way to take care of a snake bite is to avoid getting one in the first place. Knowing your local snakes and their habitats is important, especially if you are interested in hiking or other outdoor recreation. Wear appropriate clothing. In snake country, tall boots are a necessity. Since snakes are on the ground, the most susceptible bite point on a human is the leg. Avoid reaching into brush, sticking your hands under logs, or turning over rocks. Snakes like to live under objects. Poking fingers into hidden areas can be hazardous. Be watchful and wary. Most importantly, do not try to handle a snake if it can be avoided. Reaching for snakes, trying to kill snakes, or trying to remove snakes are all reasons people suffer from snake bites. Avoidance is the key when it comes to these scaled creatures. They are just as afraid of human-snake interactions as we are. Snakes, however, will attack when threatened, and that’s when the trouble begins.